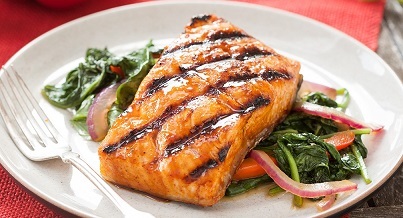 This Roasted Salmon Fillet Recipe is a very popular restaurant salmon recipe. I love the flavors created by using wild Alaskan King or Sockeye salmon and golden brown sugar with some unsalted butter and a few spices and other ingredients including soy sauce. And because of the soy sauce, this restaurant salmon recipe is called an Asian Roasted Salmon Fillet. 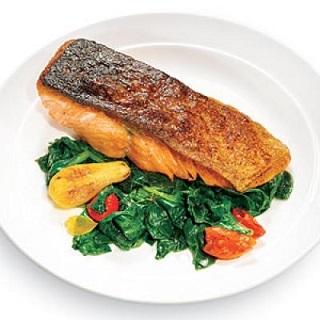 The pictures show wilted spinach served with the roasted salmon. That's it! Your roasted wild salmon fillet recipe is complete! 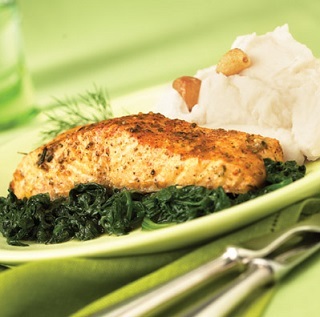 Enjoy your Asian Roasted Salmon Fillet Recipe and the company of those you share it with. Did you know? In 1533, Catherine de' Medici became queen of France; she so fancied spinach, she insisted it be served at every meal. To this day, dishes made with spinach are known as "Florentine", reflecting Catherine's birth in Florence.